GRAEME SOUNESS is considered by many, including legendary sportswriter Hugh McIlvanney, to be Scotland’s greatest ever midfielder. His achievements for club and country confirm him to be a special talent. Born in Edinburgh, Sounesss began his career with Spurs and Middlesbrough but it was after a move to Liverpool in 1978 that he truly shone. In an astonishing seven-year stint he won three European Cups, five league titles and four League Cups, making him one of Liverpool’s most decorated players of all time. He would leave Anfield for Sampdoria in Italy – winning the cup – before embarking on the next chapter of his career as player-manager at Rangers. He would launch a revolution at the Ibrox club with the financial help of new owner David Murray, sending Rangers on their way to winning nine successive league titles. Recruitment was key, Souness signing many established England internationals as well as former Celtic player Mo Johnston. Leaving Rangers in 1991, he would go on to manage Liverpool, Galatasaray, Southampton, Torino, Benfica, Blackburn Rovers and Newcastle United. 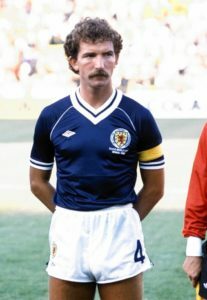 His Scotland career was also impressive, Souness amassing 54 caps and scoring four goals for his country. He now works as a media pundit, primarily for Sky Sports.